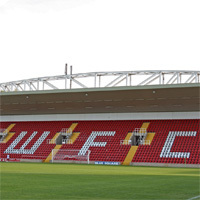 It was a sunny evening down at the home venue of Woking Football Club, Kingfield. Crawley Town were the visitors and they featured a strong side while Woking did the exact same making three change’s with Goalkeeper Aaron Howe coming in for Jake Cole, Joey Jones moving into defence in for Mark Ricketts and trialist Jordan Robertson starting ahead of Giuseppe Sole. Woking started brightly and looked dangerous down both wings, with John Nutter causing a lot of problems for the Crawley defence, but it was also a shaky start for Woking’s defence as Joey Jones nearly scored an own goal, when an easy ball came into the box, Howe called for the ball, but Jones chested the ball wide nearly creeping into his own net, luckily for Jones the resulting corner was dealt with well and the pressure was off. After this Crawley started to get into the game more, but with Crawley Town starting to settle this didn’t stop Woking causing great threat’s as the first real chance of the game came in the 19th minute with Theo Lewis taking a free kick for Joey Jones who got on the end of the delivery and made a good header only for the keeper to make a better save. From the stands Woking’s build up play was looking particularly good but then an unfortunate event happened as a penalty to Crawley Town was awarded after a Woking Player supposedly handled the ball, it was then scored by Crawley Forward Izale McLeod, who stepped up and converted well after Aaron Howe got a hand to the ball only for it to end up in the back of the Woking net. This didn’t stop Woking as their build up play continued to work well and a John Goddard shot came close but it wasn’t anything Brian Jenson struggled to handle. Coming to the final stages of the first half the ball was crossed into the Crawley Town box by winger Theo Lewis, only for it to fall to Keiran Murtagh who (On his weaker foot) sliced the ball into the stand. The Ref then blew his whistle and that was the first half. Crawley kick off the second half, but it was once again Woking who looked the sharper side with Midfielder Josh Payne creating chances in and around the Crawley Town box but Scott Rendall had the first shot of the half only for it to just go over the bar. Ten minutes into the second half both teams made changes at this point with Ricketts and Sole entering the game for Jones and Trialist Robinson, Crawley themselves bringing on Lewis Young, Younger brother of Ashley Young for Henderson, shortly after John Nutter made way for some more fire power as the young Reece Beckles was introduced into the game. Crawley then squeezed a goal after Crawley Forward Gavin Tomlin beat two Woking defenders to only have his shot blocked and then kindly falling for substitution Emmett O’Conner who squeezed in a shot from 10 yards making it 2-0 to the visitors. Crawley from this point were really putting real pressure on Gary Hills men but the back four were working hard and working well together and Izale McLeod came close with only Aaron Howe who came out big and strong stopping him in his tracks, but then the luck was with Woking who were awarded a penalty after sub Giuseppe Sole was brought down in the corner of the box and the ref felt it was enough contact to award the penalty, Scott Rendell stepped up and converted well. With Crawley making more changes including former Woking player Charles Banya coming on to the field, Woking made their own with Xapi and Nelson-Abby coming on the field for Goddard and Newton. The pace from the Crawley sub’s really showed as Young and Bawling were both very attacking midfielders who put a lot of pressure on the back four. Young midfielder Adam Brice featured on the field for the final few minutes of the game as he replaced Joe McNerney, at this point in the game the tempo of the game had seemed settled at this point with Woking not really making any chances. Second’s later the ref blew his whistle confirming a 2-1 narrow defeat against league 1 side Crawley Town. Crawley Town: Jensen (Spiegel 82), Oyebanjo (Bawling 75), Leacock (Stewart 65), Walsh (Bradley 65), Dickson (Robson 80); Simpson (Odamattey 80), Henderson (O’Connor 51), Smith, Edwards (Young 51); McLeod, Tomlin (Banya 82).